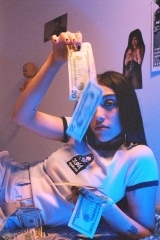 X-Girl x MadeMe launched their second collaboration, and the campaign star is Lourdes “Lola” Leon (Madonna’s daughter). Based on the theme “X-girl x MADE ME 1994”, this collection has been inspired by the items released by X-girl in the 90’s. 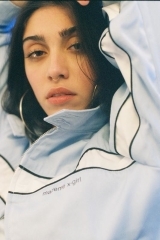 The collection consists of 10 pieces, including a quilted hooded jacket with original patch and collab logo embroidery, a Harrington jacket, a matching mini skirt, authentic half zip shirt and work pant with contrast stitch, striped L/S top and beanie, 90’s baby tee with Face logo, small bag and a socks with rainbow embroidery. 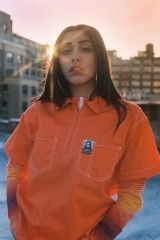 The photo campaign has a real obvious ’90s vibe and was shot around downtown New York by photographer Mayan Toledano, and video was shot by Sam Puglia.